Abhinaya, the art of expression, is an important feature in Bharatanatyam. It also is known as Bhava, which means the emotional feeling or expression felt or portrayed by a dancer. Bharatanatyam is an extremely precise dance style. If Nritta (pure dance) is the body of dance, then Abhinaya is its soul. The special treatise, which the dancers use today, called Abhinaya Darpana or the Mirror of Gestures, was written by Nandikeshvara. Yatho Bhava Thatho Rasa (Where the mood goes, there is real flavor born). Angikabhinaya: Angikabhinaya means communicating the meaning pf the songs using the body, mainly the limbs. The major limbs used are the head, hands, chest, waist, sides and feet. Some dancers also use the mention of neck as one of the major limbs. Vachikabhinaya: This means communicating the songs or theme of the songs or songs through narration. In Bharatanatyam or any classical dance for that matter though, the dancer does not sing or speak; he or she interprets the meaning of the song sung by the singer thru Vachikabhinaya. Ahariyabhinaya: This means costumes, makeup and jewelry (elaborate or subtle) to portray a particular character or meaning of a song or songs. Bharata says, "As the moon lights up or removes the darkness of the night, so will abhinaya of the body if used with the correct 'Ahariyam' (Dress) be twice as beautiful. Satvikabhinaya: Sattvika means purity or quality of Sattva. Sattvikabinaya means depicting or expressing the mood or Bhava. There are eight Sattvikabhinayas Sthambah (Stupefaction), VEDA (sweat), ROMANCHA (gooseflesh), SVARABHEDA (loss or change of voice), VEPATHU (trembling), VAIVARNYA (change of color), ASHRU (tears) and PRALAYA (collapse of the senses). Lord Shiva is believed to be the perfect embodiment of the four aspects of Abhinaya. The following shlokam describes this truth. An excellent example of Sattvika Bhava is portrayed by Arjuna in the Bhagavad Gita. When Arjuna sees his army ready to fight his gurus, brothers and others so close to his heart, he says to Krishna "My limbs fail, my mouth is dry, my hair stands on end in horror and my body quivers. The bow slips from my hands and my skin burns. I cannot stand as my legs are wobbly and my mind is just whirling." Another important aspect of Abhinaya is Bhava or Rasa, which literally means becoming or being. In Bharatanatyam, it means the condition or state of the character portrayed. Complete appreciation, knowledge and discernment of the beauty of the art leads to the true perception of the bhavas, which is called rasa, the full flavor of aesthetic experience. Shringara: As he moves or sports with the daughter of goddess earth Stadevi. May the ever benevolent Lord Rama bless, protect and show us the path of righteousness. Bageshri, the melody that is an embodiment of romanticism and a celebration of love, is one of my most beloved raagas. Bageshri also is a performance favorite with many Hindustani classical musicians, be it through the strains of the sitar, sarod, santoor or the beckoning calls from a bansuri, sarangi or violin. One of the most celebrated recordings of Bageshri that is both accomplished and endearing is by the inimitable vocalist Kishori Amonkar. Typically, the ascent of this raaga is pentatonic and the descent uses all seven notes. Nevertheless, in the imagination of an artist as creative and brilliant as Amonkar, the colors and moods of Bageshri are adroitly woven into meaningful phrases that bring joy as well as calm repose. In the fast- paced (dhrut) composition, the vocalist takes liberties with her taan (fast, oscillating) passages. In the lilting 'Aaj Sahiyo Na Jaa Biraha,' which describes the pain of separation, Amonkar's plea tugs at your heartstrings. Now pushing 70, this reclusive vocalist and teacher still performs and does occasional recordings. I prefer her albums from the 1970s and '80s with raaga Bhoopali (vilambit khyal Yeri Aaj Bhayilawa and the dhrut composition Sahelare), an astute study in quiet beauty and classicism. Amonkar's playful yet weighty rendition in raaga Jaunpuri, especially the dhrut bandish Choom Chananana Bichuwa, is the most emulated by up and coming vocalists. Her flitting raaga Pat-Bihag is impressive. This musician has successfully branched out into many genres of vocal music such as bhajans (devotional music) in Hindi and Marathi. My favorite bhajan album is Mharo Pranam, which has many enlivening and folksy bhajans of the 16th-century poet-saint Meerabai. The title bhajan (namesake of the album) is in the lovely evening melody Yaman. A more recent recording 'Ghat Ghat Mein Panchi Bolta' in raaga Bhoopali is another classic. To get a quick taste for Kishori Amonkar's vocal histrionics and charm, one must listen to the title song from the 1960s (V. Shantaram) Hindi feature film "Geet Gaya Patharone." One other female North Indian Classical musician to regale audiences with vocal acrobatics and an ability to traverse at least 3� octaves with deliberate charm is Parween Sultana. Referred to as Begum (queen), this vocalist experienced a meteoric rise in the Indian music scene in the 1970s and '80s. Sometimes dismissed by purists as a gimmicky artist, Parween Sultana nevertheless impressed hordes of music lovers through novel and exciting performances. Her rare raagas and her immense control and speed in singing fast tans, which at first amazed audiences, was something heretofore unheard of in female vocalists. Also well-known for her attractive countenance, many lay audiences merely gathered for live performances to gawk at her beauty. They came for Sultana's charm but stayed for her music. Once the vocalist established her roots on the performance scene, her music albums became popular as well. Raaga Deen Todi is my most favorite rendition of Sultana. Raagas Shyam Kalyan, Puriya Dhanashree, Marwa and Hamsadhwani are some of her other pleasing renditions. 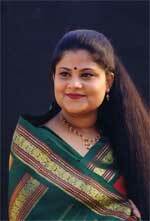 Sultana is well-known for thumri (light classical) and ghazal singing as well. Her ghazal 'Hame Thumse Pyaar Kitna' from the Hindi film "Kudrat" is a brief glimpse of the versatile appeal of this artist. Her bhajans are ubiquitous. Her signature devotional number is Bhawani Dayani in raaga Bhairavi. In the 1990s, I accompanied Sultana on the tanpura at a live performance in India. After enduring an uninitiated crowd, the musician concluded with her signature bhajan, leaving the audience totally mesmerized. Lavanya Dinesh is an accomplished performer and teacher of Hindustani classical vocal music and resides in Tampa. Lavanya regularly performs at musical venues both in India and the United States. She has three album releases to her credit. The artist has worked as a music critic and feature writer for The Times of India and Deccan Herald. She can be reached at lavanya@lavanyadinesh.com.